This impressive beast is Portsmouth Corporation 215 an AEC663T/Metro-Cammell H32/28R trolleybus from 1934. Originally delivered as 15, it was last of a group of trolleybuses of different makes of 2 and 3-axled chassis (AEC, Sunbeam, Leyland and Karrier), with different electrics and bodies (Metro Cammell and English Electric) to evaluate the most suitable for the future fleet. It was re-numbered 215 in 1938 and lent to Pontypridd UDC, along with some of its other non-standard stable mates, from 1942-46. Shown here in its maroon/white with grey roof livery, straight from the paint shop at Eastney Depot in 1949, it was scrapped in 1952. As for the evaluation, although the main fleet centred on 2-axled AEC/BUT chassis, most (100) were bodied with non-evaluated Craven bodies, with a sprinkling (9) of English Electric and, postwar, (15) Burlingham bodies! One non-standard (No.1) and one Burlingham example (No.313) survive, but, sadly, not one Craven example, the mainstay of the trolleybus fleet. The whole network was swept away, in 1963, by Leyland/MCW Atlanteans. The unexpected one-year delay in delivery of these, caused by a disastrous fire at Addlestone, resulted in a very sad-looking trolleybus fleet and a great maintenance effort to keep the vehicles in one piece and capable of moving! 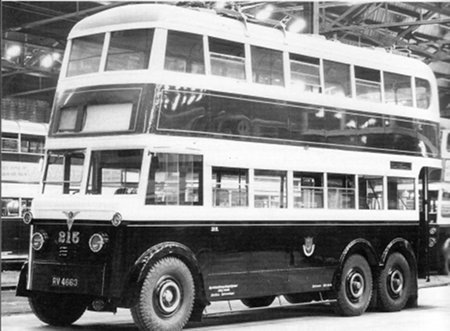 Portsmouth Corporation had a wonderful livery displayed to perfection by their paint shop work on 215 in 1949. I visited Portsmouth for a day in 1963 to ride on the remaining routes and still recall the wonderful livery of the AEC 661T/Craven and BUT9611T/Burlingham trolleybuses even at this time. I wonder what decision criteria were used by the Portsmouth managers in 1934 to choose a 2 axle fleet rather than 3 axle fleet of trolleybuses. The 3 axle trolleybus was able to accept the higher starting forces from the traction motor but perhaps this was not recognised at the time. The single worm drive differential on a 2 axle trolleybus was always subjected to much greater forces than that on a motor bus. I do believe that 3 axle trolleybus fleets had less trouble with drive failures than those with 2 axle fleets and these were compounded with the longer length 2 axle types which appeared in 1954. I do believe Sunbeam addressed this single axle drive problem by introducing a double reduction epicyclic differential axle. I do believe these appeared in Walsall, Glasgow, Belfast and Bradford. Can this be confirmed? I do know these axles made a growling noise but nothing as loud as a Bradford AEC661T "Regen". Thanks Chris for this wonderful shot of the 663T. The early PCT experimental fleet was quite fascinating, as, although not unique by any means, early trolleybus operators tended to purchase "experimental" fleets, and PCT`s such fleet was quite extensive! The MCCW bodies were obviously metal framed, whereas I believe, that the English Electric ones were composite. This gave them another feature to work out and study, as well as the chassis and equipment suppliers, giving them more reliable data before placing further orders. The subsequent 9 English Electric 661Ts were metal (I believe), as were the Cravens, but I am wondering why the change to Cravens was made. Was it simply cost based, or did PCT have similar problems to other operators of EEC metal bodies. Perhaps they had picked up rumours, and were "scared off". Who knows? A fascinating post, for which many thanks. Lovely shot of this Portsmouth trolleybus, as repainted post-war after it’s war-time loan to Pontypridd UDC with the other three six-wheelers. Three of the four returned to service after loan, but one did not (212, an AEC 663T/EEC). Incidentally all the 15 mixed test vehicles and the following 9 AEC 661Ts did not have manoeuvring batteries and were all stored from 1940 through the war on wasteland at Hilsea (apart from the six-wheelers sent to Pontypridd). They were all returned to service from 1945 onwards. I have always been fascinated by the very mixed bag of trolleybuses taken as the experimental batch of 15 by Portsmouth. It was not an even spread of orders. Four AEC 2-axles, all with the same body make. Three Leyland 2-axles, also with the same body make. Then variety is brought in – Two Karrier 2-axle, each with a different body; Four Sunbeams, but two are 2-axle and two are 3-axle, and each pair has different bodywork, and two AEC 3-axle, also with different bodies. It doesn’t seem to give a fair spread to assessing the necessary qualities. And the choice of chassis make fell to the supplier of the highest quantity! (AEC). It seems to have been common for municipals to try out an experimental batch of trolleybuses in the 1930s. But the rest had more "equal" fleets of trial vehicles. Take Belfast, which in 1938 took pairs of 3-axle Crossleys, Guys, Karriers, Leylands, AECs, Daimlers and Sunbeams. The bodywork contracts weren’t so evenly spread, but then Harkness might be expected to corner the market there. Reading made do with just six in 1936, of which two were Sunbeam (but one I think was an ex-demonstrator, so that may have been an influence), and then one each of AEC, Guy, Leyland and Ransomes. All were two-axle and Park Royal bodied the lot. In spite of two Sunbeams the next bulk order went to AEC. Bournemouth had just four trial trolleybuses in 1933, one Sunbeam 3-axle, one AEC three-axle, one AEC two-axle, and one Thonycroft single-decker – a very odd choice. But the point is that, compared to Portsmouth, there is a "one of each" approach going on. Both of the AECs were converted to a motorbus (petrol)in 1936, and the next bulk orders went to Sunbeam. Walsall had two AEC and two Guy three-axle vehicles for their tests in 1931, again a fair share to trial – they then chose Sunbeam for their main orders! It’s difficult to imagine what kind of committee sat down with manufacturer’s catalogues and selected the chosen makes for these trials in each city. But we can make sense of those that decided "one of each" or "two of each" – but the Portsmouth mix seems to defy any of that kind of logic! But it’s what keeps us interested as observers of these events of the past. Incidentally I have never read any other account than that the Corporation chose Cravens for the batch of 76 plus the 30 Leyland TD4s because of obtaining appropriate delivery dates. No mention has been made of EEC build quality. Interesting comments, observations and comparisons, Michael, much appreciated. As it happens, logical or not, their choice of bodywork for the main fleet, Cravens, was as sound as the bodies turned out to be, lasting around 25 years, although some re-building was necessary. I never realised that the non-standard vehicles were parked on wasteland for the duration. I also never realised that the other vehicles, especially the second batch, the 9 AEC 661T’s, lacked off-line manoeuvring ability. I always felt rather sad about them, living a rather shady life and always giving off an air of neglect – I’m not sure whether all of them were ever repainted. Considering the far less use they got, this was surprising. I always thought them the nicest looking of all the trolleys, even in comparison with the later Burlingham-bodied examples. The Pontypridd escapade fascinates me. Can you imagine the towing of these large six-wheel vehicles over to Bristol, over the Aust Ferry, then up the valley to Pontypridd, an estimated 150 miles without motorway or Severn bridges. Or, if the Aust Ferry wasn’t man for the job, a journey via Gloucester would have entailed a 190 mile slog! I daresay these journeys were not without incident! Don’t forget that every one of the Cravens trolleybuses would have been towed down the even greater distance from Sheffield! Towing trolleybuses would have been an everyday occurrence in those days – think about Glasgow’s with Weymann bodies! And, of course, the chassis would have had to be towed to the bodybuilders first! Wartime loans fascinate me too Chris! Bournemouth trolleys running in Newcastle, Southend in Bradford, Hull in Pontypridd. Quite a few examples and some interesting pre-motorway routes to plan! You raise in my mind an interesting point, John. If Pompey sent its four six–wheelers to Pontypridd and Hull also sent some, what was the reason? AS a UDC (Urban District Council), it’s hard to believe it had a large fleet of vehicles, especially trolleybuses, and enemy action seems unlikely to be a significant cause, was it an upsurge in coal production and colliers, mainly impressed (and probably unimpressed!) Bevin Boys? Re. wartime loans of trolleybuses. The bus fleet in Pontypridd exploded (if I can use that term) during the war. The fleet strength in 1966 was 53 yet during the war they received 21 utility double-deckers and 2 unfrozen double-deckers. There were also eight utility trolleybuses which became the postwar fleet but they were really used to replace the pre-war fleet which it must be remembered was mainly single-deck EE vehicles which later moved to Cardiff, as well as releasing the loaned vehicles. There had been 8 LT ST-types on loan as well. This reflects the boom in demand during the war years, with local collieries and factories working flat out and therefore a greater need for transport. It’s probable that not only were more people travelling but also they were travelling further – there was certainly a lot of long distance travelling to the various Royal Ordnance Factories. The trolleybus route served very little directly and the way the traffic on that route expanded was probably more complex. The southern end of the route at Treforest was a long way from Treforest Trading Estate which was a major source of employment at the time and therefore would not have been used to take people there. Maritime Colliery in the centre of Pontypridd would have generated some traffic but its location in the centre of town means workers could have come from anywhere. Albion Colliery was the only large colliery directly served by the route and was at the northern terminus at Cilfynydd. John – Your post triggered something else in the back of my mind about Bournemouth trolleybuses on war loan. No fewer than 18 of them were lent to London Transport between December 1940 and September 1942, partly being relieved by some new ones destined for South Africa being diverted to London. Braking-wise, they were not up to the job of London’s demands. They had to go to Ilford Depot because of their exceptional height – 15′ 11"! Ilford had no routes which went under low bridges. John W – CPPTD lent some 3-4 TSM buses to London around the Blitz for six months and a couple more locally towards the end of the war. They lost several buses when Eastney Bus Depot was bombed (including the sole AEC Regent they ever owned!). They then took in 10 Bedford OWBs and 9 Daimler CWA6’s in the middle of the war, but I would say that they were well positioned with trolleybuses. They also had some Leyland Lynxes surplus from sea front duties, but I don’t know if they were ever used in anger! So the fleet just about remained the same or slightly larger. This doesn’t really answer the question about pressure in maintaining services, though. Thx, David B, for a wonderfully detailed picture about Ponypridd’s situation in the war. It goes to show how a war can distort situations and produce hotspots which, in normal times, would never arise. I’ve seen photos of LT ST’s all over the place in wartime, but never any in Pontypridd, not even by that ubiquitous bus photographer, DWK Jones!